The idea was to try out the marked path to Tamariu from the lighthouse at Sant Sebastia above Llafranc then come back along the GR92 to complete the next stretch of the coast path for the blog. Sometimes though, when we go walking things don't quite turn out as planned as unfortunately the GR92 was being repaired (winter damage is a continual problem for the path) and so not accessible for the whole of the route. 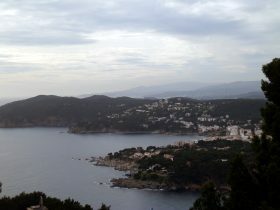 It was also a little overcast, so we'll have to repeat and get some of the classic bluesky photographs (see Tamariu to Llafranc revisited for an update). Llafranc is an old fishing village with a harbour and large sandy beach, with chic restaurants along the promenade overlooking the sea (the Daily Telegraph describes it as che-che). Though small it is quite upmarket. 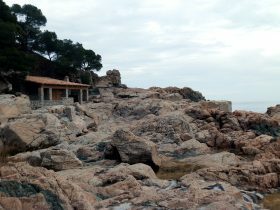 To the south is an easy walk around the headland to Calella (described in our Mont-ras to Llafranc and Calella walk). 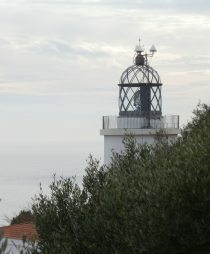 Along the coast to the north is the lighthouse of Sant Sebastia. If you see a postcard of the Costa Brava with a picture of a lighthouse, this is likely to be it. 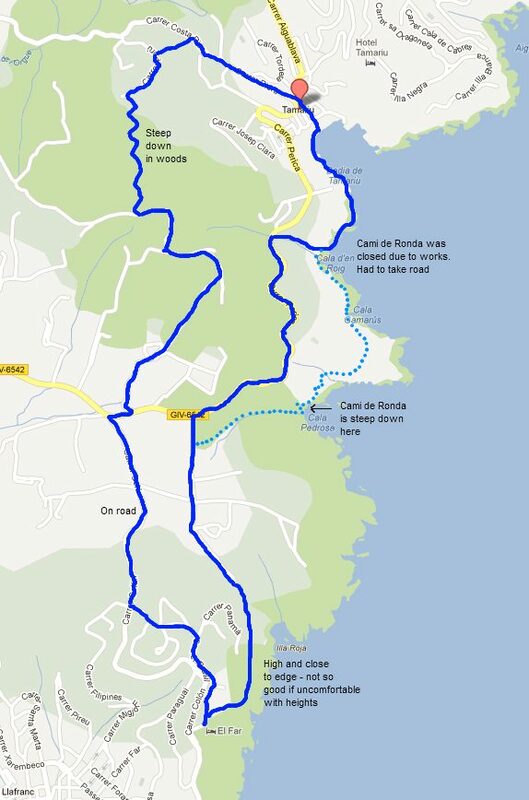 You can obviously walk up to the lighthouse from Llafranc, but having done that a few times, it's quite steep and all roadway and Llafranc can be difficult to find parking. So rather than start in the village we drive directly to the lighthouse (follow the Tamariu road out of Palafrugell) - this is both easier and gives a great view over the countryside and down the coast towards Palamos. There is parking but it can be busy. We parked just under the hotel/restaurant just above the lighthouse itself. The walk starts and runs down past the excavation site of the Iberic village. We wanted to do a circular route, and we wanted to follow the marked path to Tamariu so we followed the path marked by green-white flashes which runs along the road away from the sea, eventually reaching the Palafrugell-Tamariu road. The marked path then crosses the Palafrugell-Tamariu road just to the right after the Llafranc junction, rather than down the hill towards Tamariu. On the other side of the road it directs you along a dirt track in among isolated houses in the woods. The flashes are now yellow-white. Follow the track through the woods and keep looking out for the flashes. You would think the path would go down, but actually it goes up and stays high above the village following the tracks to the houses. One of the tracks turns to the right, past a couple more houses and then you've got to look out for the turning. It's marked on the tree as you go past, but you have to keep an eye out for the flash as the path doubles back sharply into the woods and turns into a single-track footpath heading down. This runs gently downhill through the woods to start with, before becoming quite a lot steeper. We had to support ourselves on the trees so as not to slip over. Eventually you reach the bottom and emerge at the top of an estate above Tamariu. Walk down through the estate (we found a short cut down a long flight of steps) before emerging towards the bottom by Camping Tamariu and out along the road to the village itself. While Tamariu bustles in summer, in winter it tends to close down almost completely. The shops and restaurants were all closed in January. 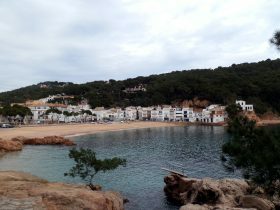 This is contrast to Llafranc or Calella where there is always some activity all year around and obviously in total contrast to the larger neighbouring towns of Begur or Palafrugell which have large permanent populations. The GR92 runs into the village, before leading out across Tamariu's beach where it runs to the left of the beach, climbing over rocks and out to the headland. Around the headland you have to cross a rocky outcrop dodging among the rock pools - there is no easy flat path here. Our intention was to follow the path all the way around to Cala Pedrosa but subsidence and some works on a local villa meant it was impossible to follow the path around. We have taken the path before and it is quite wild. 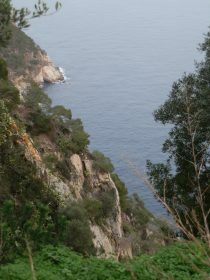 There is also a step descent down into Cala Pedrosa. Instead we had to head back up to the main road and follow the road out. The road is bendy and though there is not much traffic at this time of year, there isn't any separated walking space. 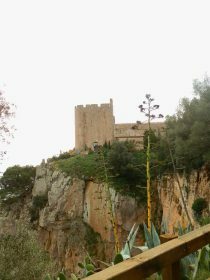 There are two large estates off the road - the Musclera - a large house with gardens that extend down to the sea; and La Pedrosa which takes up all of the next hillside. After La Pedrosa estate take a track to your left. This rejoins with the GR92 as it emerges from Cala Pedrosa. The path continues straight on past the farmhouses and back into the woods. In the woods, the path climbs gently and you slowly rise above the sea. As you get to the last stretch, the path is about 150m above the sea and though not a vertical cliff, to your lefthand side, the edge falls away below you steeply. For those uncomfortable with heights the height, closeness of the edge and narrowness of the path potentially make this a little nerve-wracking. As you reach the top you'll see the watchtower at the back of the hotel. The path climbs up steps and then emerges at the top. The path skirts the watchtower and along back to the hotel. Update: The path to Cala Pedrosa has been reopened with a new high quality walkway (Nov 2013). The route down to Cala Pedrosa also seems to have more guiderails/fences making the route down (or up) easier.